“If wisdom shall enter thy heart, and knowledge please thy soul,” says King Solomon in Proverbs 2:10-11, “counsel shall keep thee and prudence shall preserve thy soul.” Prudence involves planning ahead, anticipating pitfalls and taking steps to avoid them. And as the wise king advises, prudence can preserve what we hold dear. For income property investors, prudence means planning for the upcoming tax season by taking a year-end inventory of the deductions and credits available for owners of residential income property. Since tax laws are frequently being updated and situations change, property owners may be eligible for new deductions and ways to save on taxes. Repairs, improvements and costs of doing business as an income property owner are all eligible for deductions. 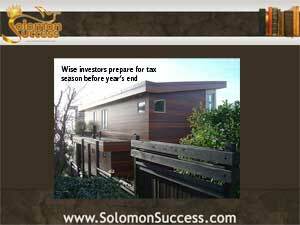 Now is the time to take a year-end inventory of expenditures and other transactions related to maintaining investment properties for smooth sailing in the coming tax season. Expense or depreciation? Generally speaking, repairs to a property, such as fixing a hole in the roof are written off as expenses in a given tax year, while improvements such as putting in a completely new roof are depreciated over the life of the improvement, or of the rental property itself. Short-term assets related to the property, such as refrigerators, air conditioners and other appliances can also be depreciated over a five-year span. External assets such as sidewalks, fencing or patios depreciate over 15 years. It’s important to consider everything related to the property’s appearance and functioning to maximize tax deductions. Since interest is generally one of the largest deductible expenses related to income property, it’s possible to increase your interest expenses for the year by prepaying a January mortgage payment. If you’re employing anyone to assist with the property, it’s also possible to prepay any Social Security, Medicare or unemployment taxes associated with their employment. Home office expenses are a well-known deduction, since managing income property is a business. But in addition to this, it’s also possible to deduct space used as a workshop related to maintaining rental investments. A space such as a garage or shed devoted to storing tools and equipment needed for managing the property also qualifies as deductible under the same standards as a home office.